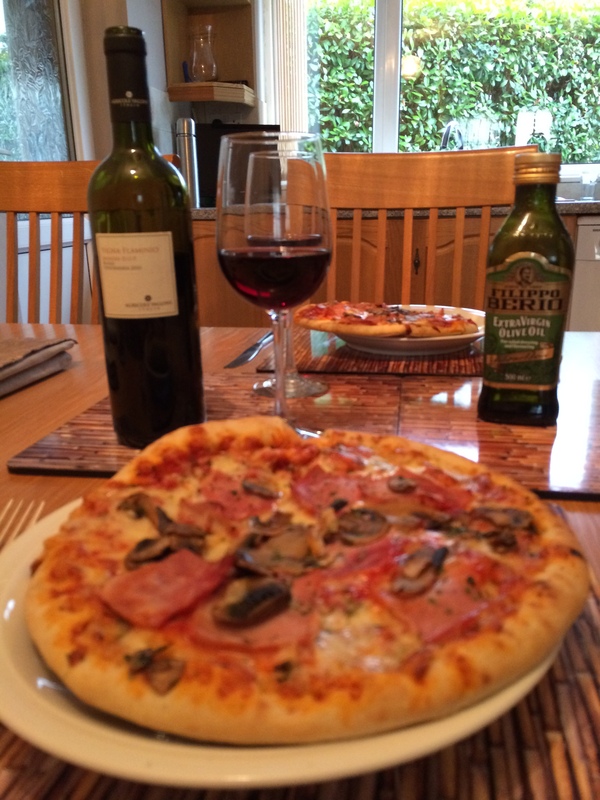 For a quick meal we ate a stone-baked Italian ham and mushroom pizza from Tesco. The pizza has a Napoli-style base with Italian tomato sauce, topped with Italian ham and mushrooms. 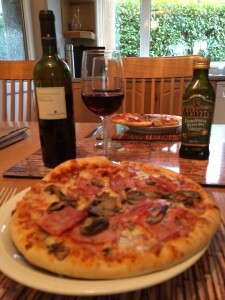 We paired the pizza with a bottle of Brindisi Rosso Vigna Flaminio, Vallone 2010, an Italian red from the Wine Society. This lightly-oaked, medium-bodied red is from the south of Italy and is made from the Negroamaro grape. The wine had plenty of acidity to match the tomatoes, red fruits, smokiness and was spicy on the finish. A very good match with the pizza. For a midweek meal we cooked Fettuccine alla Romana from Supercook. This is a tasty, colourful Italian dish of fettuccine noodles with a sauce containing canned tomatoes, onion, garlic, mushrooms, red wine and a little sugar. It is served with grated Parmesan sprinkled over and fresh crusty bread . We had difficulty finding fettuccine in our local shops and eventually found some in Waitrose made by De Cecco. It was very expensive and, whilst it was very nice, frankly we didn’t think the difference in taste justified the huge hike in price from standard own-brand pasta. We opened a bottle of Tesco’s Finest Gavi 2012, an Italian white made from the Coretese grape. This crisp, dry wine had a citrussy freshness with flavours of pears. It was a good match with the meal. Good wine pairings with pasta and Bolognese sauce can be a challenge. If the sauce is ready-made or from an English cookery book recipe, it is likely to be herby, garlicky, very tomatoey and sweet. The traditional and authentic Italian Ragu is much milder in flavour and needs more gently-flavoured wines, preferably whites. (See here for how we learned our lesson the hard way). The renowned Italian chef, Antonio Carluccio wrote an interesting article in the Daily Mail about the differences between the British adaptation and the traditional. We tried his Ragu recipe from the article and served it with Tagliatelle as suggested. The Bolognese sauce contains pancetta, carrot, celery, onion, minced beef and pork, dry white wine, chicken stock, tomato paste, salt and pepper. We sprinkled some fresh Parmesan cheese over the dish. Try this recipe and taste the difference. We paired the meal with a bottle of Stenmari Grillo Sicilia 2011, an Italian white from the Wine Society. The wine was mellow with tropical fruits, a little melon and an intense grapefruit finish. We thought it was a lovely wine and a good match. We w ill try our next bottle of this wine with some fish or seafood. We tried the Seafood Risotto recipe from Jamie’s Italian, which contains a mixture of fish and shellfish with fennel, tomatoes, carrots, bay leaf, parsley and lemon. 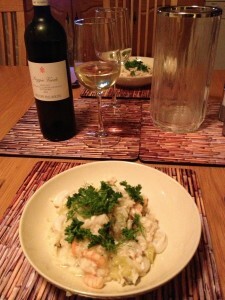 The risotto bianco is cooked in white wine, fish stock and flavoured with onion, garlic, celery and Parmesan. We thought the recipe was only OK and we wouldn’t do it again. We opened a bottle of Poggio Verde Frascati Superiore 2011, an Italian white from the Wine Society. The wine was crisp, citrussy with a creaminess and we enjoyed it. It was a fair match with the food. We had some of Teresa’s version of Spaghetti Bolognese this evening. Rather than the typical English cookbook version, which tends to be herby, tomatoey and slightly sweet, it is more towards the traditional mildly-flavoured Ragu version. 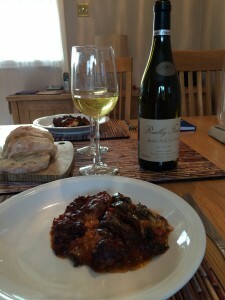 See 24th Aug 2011 and 1 June 2011 for some previous pairings with Spag Bol. We tried two wines with the dish and we found neither were particularly good pairings. The first was Nespolino Sangiovese 2009, a Sunday Times Wine Club Italian red from Rubicone. Nothing wrong with this wine in itself – It paired beautifully with Meatballs in Tomato Sauce (see 23 June 2011), but we felt this time the cherry flavours were somewhat muted. We switched to a Porta Reserva Cabernet Sauvignon 2010, a Chilean red from Costco. We felt this paired better. The black fruits were full in the mouth and the tannins were rounded, but it was still not a stunning match. Maybe we should try a gentle Italian white next time. We had more of the previous evening’s Italian Beef and decided to switch to a Portugese red – Quinta do Casal Branco Ribatejo 2007 from the Sunday Times Wine Club. This oaked wine is a blend of local Portugese grapes Alicante and Castelão with Cabernet Sauvignon. Rich, juicy, spicy and full of flavour, but after a couple of sips we knew it wasn’t right for this particular dish. We set it aside and enjoyed it with some Cheddar and Sant Agur cheeses later. Instead we opened a bottle of Sierra Almiron 2009, a Spanish red also from Sunday Times. We last drank this with Spaghetti Bolognese (see 24th August 2011). This medium-bodied, Tempranillo-based blend from La Mancha was a much better match than the Ribatejo, but not on a par with the Chianti from last night. The Spanish wine was spicy with redcurrant and cassis flavours and also had a slight woodiness, with enough sharp acidity to cope with the white wine and lemon sauce. It was much more enjoyable than when we had it with the Bolognese previously.